Your little princess is sure to be a hit on her special day with our personalized pink rainbow lollipop birthday tutu outfit! Great for candy themed birthday parties. 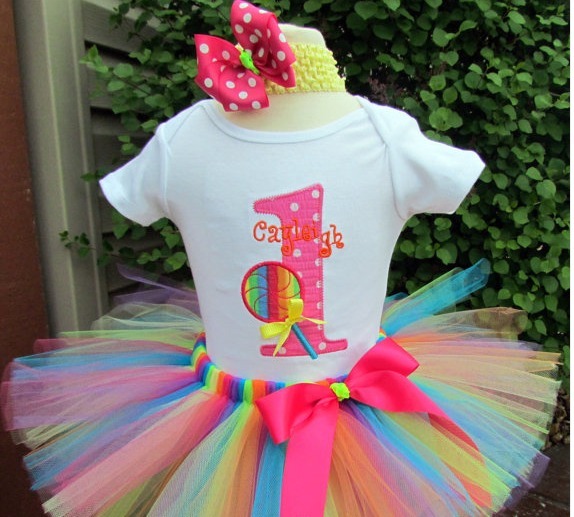 ~Custom Boutique birthday Lollipop Shirt or Onesie (Created on a shirt or Carters onesie) Sizes 12mo.-4yrs. ~Matching Flower Clippie or hair bow... You may also request a headband if you little one does not have much hair! Some of our products are made with rhinestones and/or sequins or other small items that could pose a choking hazard to children under 5 if they come loose, we do not recommend selecting these extras for small children under 5 however if you do please supervise your child carefully ~ We cannot be held responsible for any incidents that occur if you choose to add these extras to your purchase. This item is custom made in the US. Please allow up to 18 business days (Monday thru Friday) for your order to be created, plus shipping time.